As you can see from the votes in the U.S. Senate yesterday, attempting to trade Amnesty risks extreme disaster for America and Americans. The DC-based immigration groups that tried to negotiate with our enemies brought us to the brink of destruction and ALIPAC was the only national organization fully fighting to stop Amnesty this week. When the three Amnesty bills were defeated during cloture votes yesterday, it marked ALPAC's 7th successful national battle to shut down Amnesty legislation in DC! So many of our own supporters thought we were going to lose, but hats off to each of you who knew battles are not decided until they have been fought! The enemies of America are quite convincing with their propaganda and psy-ops operations designed to defeat us before the battle begins! The groups and lawmakers pushing Amnesty deals obviously lack the control and influence necessary to assure any such legislative deals would be honored, and if the law had passed, their control would be even less on actual policy implementations. I hope that NumbersUSA, FAIR, and the Center for Immigration Studies along with Steven Miller and President Trump will abandon these ill-advised efforts to pass Amnesty for illegals. DACA is toxic. DACA Will Not MAGA (Make America Great Again), and the bogus polls cited in White House emails yesterday don't change the fact that most Americans, including 67% of likely GOP primary voters, want our existing immigration laws to be enforced! NumbersUSA, FAIR, and the Center for Immigration Studies flirtations with Amnesty deals brought America to the brink of destruction with the Schumer immigration comprimise bill falling only 6 Senate votes short of the 60 needed for passage! That bill would have granted amnesty to 1.8 million illegal aliens and blocked the removal of 12 million illegals and even covered illegals coming into America in the next 4 months! Even if the Goodlatte Secure America First Amnesty bill (Currently backed by NumbersUSA) passes, the Amnesty part will happen leading to more amnesty bills that will pass while the enforcement promises fade into obscurity. The lack of enforcement of our current immigration laws, the trickery we have seen in other immigration bills like Durbin's 2010 Dream Act bill that ALIPAC defeated, and the failed promises of the 1986 Amnesty that created our current illegal immigration crisis all prove this! If the President's pen ever signs a bill with any form of Amnesty for illegal aliens in it, it is game over for America. This is the design and plan of those behind this invasion. The Dream Act and DACA Amnesties were created by those who are responsible for the non-enforcement of our immigration laws and the deaths of tens of thousands of innocent Americans. Why is anyone foolish enough to believe giving these power groups what they want will save us? The answer is to turn the conversation away from new legislation and despicable ill-advised Amnesty deals of surrender by lawmakers and DC groups who have given up on our current laws and Constitution, shut down the Goodlatte Amnesty surrender bill in the House next week, and return the focus to restoring America's existing immigration laws. Instead of focusing the nation on "helping DACA" recipients, our focus should be on getting illegal alien voters out of our elections by this November, getting them out of jobs, getting them off of welfare, and out of our nation. Instead of being focused on Amnesty, we should shut down the new Trump Amnesty inspired surge of illegals on our southern border and send the National Guard and elements of the U.S. military to the border to secure it so we can deport large numbers of dangerous illegals to the other side of our secured borders! And if President Trump and members of Congress won't do that job then we need to find people who will and put them in power as soon as humanly possible by harnessing the huge national movement of great Americans who elected Trump despite insurmountable odds and obstacles. Trump may not have meant what he said on the campaign trail, but more than 60 million Americans voted to deport illegals and truly secure America. 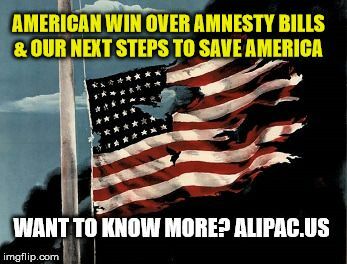 ALIPAC has a new plan to shut down the Amnesty bill in Congress next week now that the battle is won in the Senate, and we hope that NumbersUSA, FAIR, and Center for Immigration studies will not stand in our way and will instead return to their previous stances against any form of Amnesty for illegals. Being invited for special dinners at the White House must be very charming, but they need to grow a spine and tell Trump and his minions No Deal On Amnesty. And that goes for members of the Freedom Caucus like NC Rep. Mark Meadows who just finished wining and dining with Trump in Davos, Switzerland, with the Bilderbergs and World Economic Forum globalists who want the U.S. to have open borders and unlimited legal and illegal immigration too! The American public just handed them another legislative defeat yesterday, and it took Democrats to provide the win this time. And we all owe very special thanks to the Republicans who voted with the Democrats against Amnesty 3 times yesterday while voting YES to end Sanctuary cities. I've included their names beneath this letter; please call their offices to say, "Thank you for voting against ill-advised nationally destructive Amnesty deals for illegal immigrants!" Only by returning the United States to Constitutional law and governance and ending the current state of martial law (departure from normal law) being implemented over us on behalf of millions of illegal alien invaders backed by billionaires can we have any hope of putting the American public back in charge of our nation! All of the Amnesty compromise bills are designed to prevent that from every happening... permanently. All of the Amnesty comprimise bills are designed to rubber stamp unconstitutional orders and practices by the Executive Branch which facilitate the costly and deadly illegal immigrant invasion of America. A lot more people are watching and listening to ALIPAC now that we have emerged from the smoke and chaos of the Senate immigration battle victorious in an important battle. The war to save America is far from over and next week we will move to successfully shut down the Goodlatte Amnesty bill HR. 4760. We have learned many important painful lessons in this battle. We learned that Trump cannot be trusted to keep his campaign promises nor does he care for his Constitutional obligations or Oath of Office. Trump's Dreamers and Trump's DACA orders are as illegal and unconstitutional today as the day Obama made them with memos because groups like ALIPAC had stopped the Dream Act legislation the elites wanted. We learned that Senators we thought were on our side like Senators Cotton and Grassley were not really on the side of the Americans in this battle. We learned that other immigration restriction groups we thought we could trust can be co-opted and led astray by the dazzle of special White House meetings. But we also learned that the Lord and the American Spirit still animates many Americans in this battle and the true power of We The People of America is still a factor that can win legislative and campaign battles against the evil powers behind the illegal alien invasion and overthrow of our American Republic! Three cheers to each American who stood up and fought back with and through ALIPAC to defeat Amnesty bills in the U.S. Senate! Please be ready to seize the initiative on Monday and advance against those responsible for these betrayals and Amnesty deals! PS: Please call and thank these GOP Senators for listening to your voices! Should we offer some of them our endorsement for voting our way when the rubber meets the road? Last edited by ALIPAC; 02-16-2018 at 02:57 PM. Beezer, Judy and JohnK like this. They need to be discussing the "proposals" these countries are putting in place to take their people back. Where are the discussions with THEIR Presidents? No more money to these countries. We are not the solution to their problems! They have land, they have resources...they cannot continue to dump their citizens in our country any more. Judy and JohnK like this. Thank you all so very very much!! imblest, Beezer and JohnK like this. Sessions: Will We Abandon American Workers–or Save Them from Obama's Amnesty? Intense Fighting To Save America From Amnesty 2013 this coming week!